The best movie that Danny Boyle’s ever made (which is saying something) and the only movie other than Requiem for a Dream that will never, ever make you want to touch a drug for the rest of your days. They should start showing this sucker in D.A.R.E. 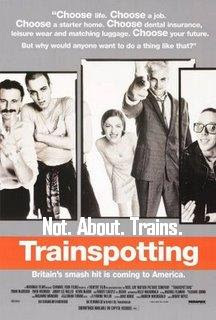 Trainspotting is about an on-again-off-again Scottish heroin junkie named Renton and the eccentric group of on-again-off-again heroin junkies he hangs out with. The plot more or less revolves around Renton’s struggle to kick the habit and set off on a brighter path that doesn’t follow his friends down the ugly slope that comes with doing heroin all the time. That plot line might not sound all that crazy to some, but when was the last time you were hooked on heroin? I could go on and on about how awesome director Danny Boyle is, so I’ll keep it brief. The great thing about Danny Boyle is that each time he makes a movie it’s totally different from anything else he’s done, and nearly every time it’s absolutely great. It’s about time he got his due this past year with Slumdog Millionaire because he’s been doing his thing for 15 years now and he’s been doing it a lot better than most. So good for you, Danny boy. This movie is his second effort after starting his career with a wild horror movie/psychological thriller called Shallow Grave, which I highly recommend. Trainspotting is one in-your-face movie that slams on the gas pedal in the first frame and doesn’t let up until the credits roll. It’s an intense, gritty, gross, funny, dark, and harrowing movie that you might not know what to make out of when it’s all over, but it’ll stick with you. Few movies really dig this deep into the life of a junkie (not that I have any experience on the matter), but Boyle quickly makes the audience feel like they’re part of Renton’s gang whether they like it or not. The characters are all great and unique, so are the actors, and the script is equal parts shocking and insightful. I read the novel it’s based off by Irvine Welsh a while back, and that was even better. You may not think there’s much you’d have in common with a group of Scottish dope fiends, but it ends up being a really relatable story about a group of friends struggling to find some sense of direction in their lives…and they all happen to do heroin. The one drawback to this movie is that everyone talks with pretty thick Scottish accents and use lots of Scottish slang, so it takes some pretty sharp listening to catch what everyone’s actually saying to each other if you’re not fresh off the boat from Scotland. There is some really funny dialogue, but it might take you a second or third viewing to get it all down. In a nutshell, Trainspotting is totally insane and it’s utterly brilliant. It’s like mixing together Pulp Fiction, Requiem for a Dream, and The Breakfast Club, and everyone sounds like Sean Connery. It’s not for the faint of heart, and that’s kind of a strange analogy, but there’s just nothing else like it. So long live Danny Boyle and don’t. do. heroin. I’m a weird person I think that if your really good at doing something having people say your great is what’s better than being awarded it. Which is why i’m not glad Danny Boyle won, though he deserved it, I think that kind of ruined him and his status as a great cult director. But anyway this is surely great and Ewan McGregor surely shows his great acting chops. Also just use subtitles if your having a problem with hearing them. It’s become my personal running joke that any Scottish actor worth his salt was in this movie. Saw this movie, but am not in love with it. Probably because of the subject matter. I don’t enjoy watching movies about drugs, drug addiction and the havoc it wreaks in people’s lives. Due to the fact that I come from a Commonwealth country and am, as a result, a bit of an Anglophile, I watched this movie simply because of the actors and their accents. I love Scottish accents. Stupid reason to watch a movie, I know, but there you have it. Shallow Grave was excellent and will remain my fave Danny Boyle movie (did not know that he was the director for this until I read your review of Trainspotting). It’s another movie I watch whenever I get the chance. Too bad not many people know about this movie. Every time I mention it to someone, I get a blank look. Holy hell, I LOVE Shallow Grave and I rarely meet anyone who thinks it’s excellent or has let alone seen it. One of those rare movies I watched back-to-back I liked it so much, not surprised Boyle’s career took off like it did after that. Trainspotting (1996) – What the Hell Should I Watch on NETFLIX?